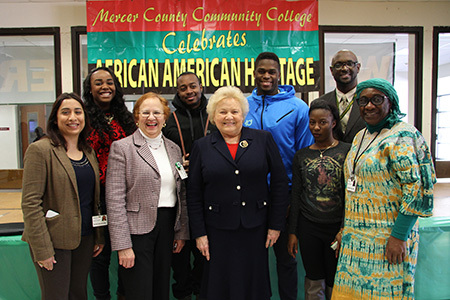 West Windsor, N.J. – Black History Month is off to a rousing start at Mercer County Community College. 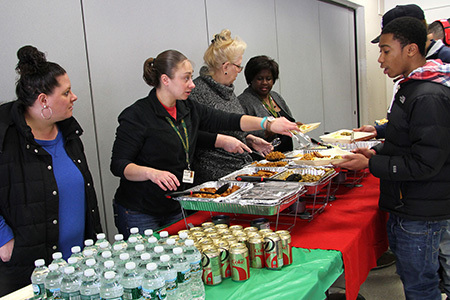 A packed house enjoyed international cuisine yesterday in the West Windsor campus cafeteria and a stirring address by Adjunct Professor Michael Fisher wowed the crowd at the Opening Ceremonies on Feb. 3. Master of Ceremonies Lucia Brown-Joseph welcomed students, staff and faculty and encouraged the audience to embrace this month. “Black History Month honors historic Black leaders, creates awareness for all people, and helps us be better stewards of the rights we have gained. It reminds us that Black history is part of American history and belongs to all of us. It draws people of every race into the grand and diverse story of this nation,” Brown-Joseph said. Fisher added that the Civil War and the civil rights movement of the 1960s set the stage for the advancement of human rights for other oppressed groups. 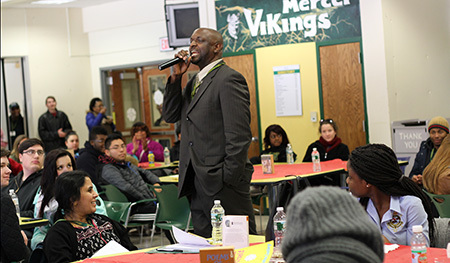 He emphasized that students should expect a lot from themselves and from life. "Live a life so they cannot forget you. And pass the torch while you do it,” Fisher intoned. By the end of his remarks, he had students on their feet, clapping and cheering. Black History Month events continue this Saturday, Feb. 7 with “Gospel Fest” at Kelsey Theatre from 3:30 to 6 p.m. Local churches and youth groups will join for an intergenerational celebration of gospel music. Participants include groups from Mount Olivet Baptist Church in Hightstown and Beauty Grove Primitive Baptist Church in Trenton. The full events schedule is available here. Admininistrators and students ready to start the celebration of Black History Month. Adjunct instructor Michael Fisher engaged one and all with his powerful speech. 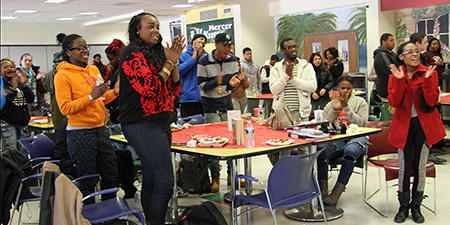 Students showed their appreciation for Fisher's rousing words. Staff volunteers served the buffet lunch.